Breakstone, White & Gluck is pleased to announce we will donate 750 bike helmets to children in Greater Boston this spring and summer. Read our media release. Our goal is to encourage children to wear helmets every time they ride. Wearing a helmet is a critical step to preventing head injuries. According to the Insurance Institute for Highway Safety, wearing a helmet can reduce a cyclists's risk for head injury by up to 50 percent. In Massachusetts, the law states children 16 years old and younger must wear bicycle helmets. 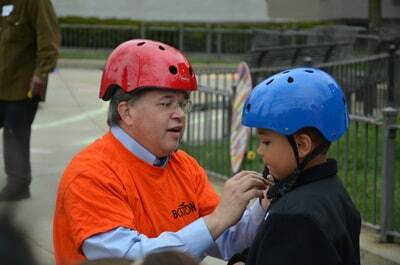 Breakstone, White & Gluck is donating the helmets through several programs: Mayor Menino's Boston Bikes Roll It Forward program; CYCLE Kids of Cambridge; the Winter Hill Community School in Somerville; and the Dedham Bike Rodeo. Boston Bikes fixes up used bikes through its Roll It Forward program and will give helmets to children who receive bikes. At Winter Hill Community School, the Somerville Kiwanis Club will give helmets to children who need one on its annual Bike Safety Day. 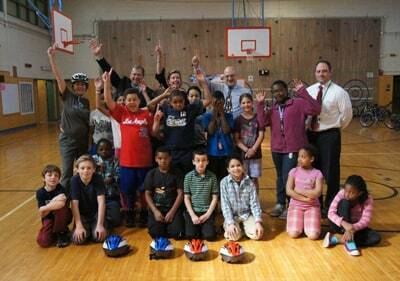 CYCLE Kids and Breakstone, White & Gluck will donate helmets to fourth graders at Cambridge public schools. In Dedham, the annual bike rodeo is hosted by Dedham Police and the Park & Recreation Department. Hundreds of kids come out each year for cycling, activities and a BBQ lunch. In addition, the firm made an unrestricted donation to Bikes Not Bombs of Jamaica Plain to support its youth cycling programs. We will provide the program with helmets as needed. Breakstone, White & Gluck has represented cyclists who have been injured by negligent drivers for more than 20 years. We are committed to providing each cyclist we represent with the best results. But we are also committed to preventing cycling accidents and improving safety for cyclists. Over the years, we have supported numerous bicycle organizations, including MassBike, Charles River Wheelmen, Northeast Bicycle Club and NEMBA. If you are a cyclist, knowing and following the rules of the road, and always riding defensively, are the best ways to prevent an accident. Financially, the most important step you can take is to purchase insurance on your personal vehicle which could provide coverage for injuries, medical expenses or lost earnings if you are hurt by a motorist with inadequate insurance. If you are injured in an accident, there is a good chance you will have to look to your own auto insurance policy to provide compensation. Many drivers do not purchase the required coverages and others do not purchase an adequate amount to cover your injuries. We encourage you to read our article and learn about the importance of purchasing adequate amounts of Underinsured and Uninsured Motorist coverage, as well as an adequate amount of Medical Payments coverage. Breakstone, White & Gluck is a Boston law firm which specializes in personal injury, bicycle accident and car accident cases. Our attorneys have been recognized for their work with selection to the Top 100 New England Super Lawyers and Top 100 Massachusetts Super Lawyers. We have also received the highest ratings from Martindale-Hubbell and Avvo. If you have been injured, contact our attorneys for a free legal consultation at 800-379-1244 or 617-723-7676 or use our contact form.